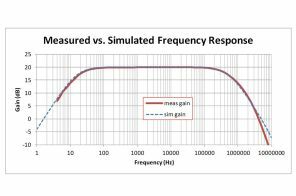 This design amplifies an ac signal, and shifts the output signal so that it is centered at one half the power supply voltage. Note that the input signal has zero dc offset so it swings above and below ground. 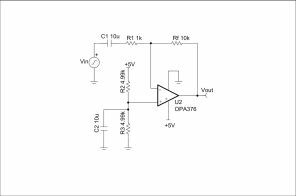 The key benefit of this circuit is that it accepts signals which swing below ground even though the amplifier does not have a negative power supply.